a = wdf2allpass(w) accepts a vector of transformed real allpass coefficients, w, and returns the conventional allpass polynomial version a. w is used by allpass filter objects such as dsp.AllpassFilter, and dsp.CoupledAllpassFilter, with Structure set to 'Wave Digital Filter'. A = wdf2allpass(W) accepts the cell array of transformed allpass coefficient vectors W. Each cell of W contains the transformed real coefficients of a section of a cascade allpass filter. The output A is also a cell array, and each cell of A contains the conventional polynomial version of the corresponding cell of W. W is used by allpass filter objects such as dsp.AllpassFilter and dsp.CoupledAllpassFilter, with Structure set to 'Wave Digital Filter'. Every cell of W must contain a real vector of length 1,2, or 4. When the length is 4, the second and fourth components must both be zero. W can be a row or column vector of cells while A is always returned as column. Create a second order allpass filter with wave digital filter coefficients w = [0.5 0]. Convert these coefficients into polynomial form using wdf2allpass. Assign the polynomial coefficients to an allpass filter using the 'Minimum multiplier' structure. Pass a random input to both these filters and compare the outputs. 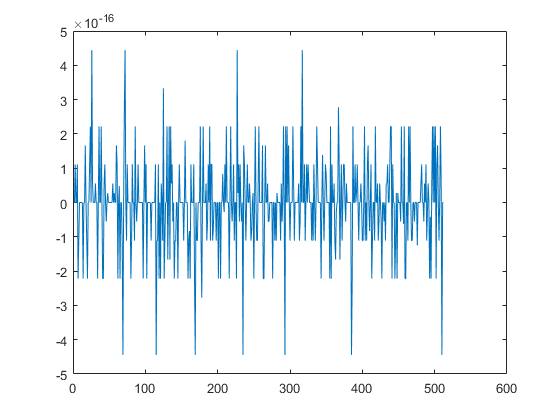 Numeric vector of transformed Wave Digital Filter allpass coefficients, specified as a real number. w can have only length equal to 1,2, and 4. When the length is 4, the second and fourth components must both be zero. w can be a row or a column vector. Cascade of allpass filter coefficients in transformed Wave Digital Filter form, specified as a cell vector. Every cell of W must contain a real vector of length 1, 2, or 4. When the length is 4, the second and fourth components must both be zero. W can be a row or a column vector of cells. Numeric vector of polynomial allpass coefficients, determined as a numeric row vector. Cascade of allpass filter coefficient, determined as a column of cells, each containing a vector of length 1, 2, or 4.
wdf2allpass provides the inverse operation of allpass2wdf, by transforming the transformed cascade of allpass coefficients W into their conventional polynomial representation A. Please refer to the reference page for allpass2wdf for more details about the two representations. W defines a multisection allpass filter, and wdf2allpass applies separately to each section, with the same transformation used in the single-section case. In this case, the numeric coefficients vector w can have order 1, 2, or 4.